Margaret Jaconelli’s fight against eviction has dominated the ongoing discussion about Glasgow 2014 for years and will also play an important role in this panel discussion. Margaret Jaconelli purchased her Dalmarnock home in 1976 and has lived as the sole remaining resident of Ardenlea St since 2002. With the Commonwealth Games fast approaching, the council wished to demolish the whole street which occupies the site of the proposed Athlete’s Village. All the other residents have been re-housed- but Margaret, as one of the few who owned her property, refused to move until offered adequate compensation. For four years she was on a one-woman crusade to save her family from being evicted whilst the rest of Dalmarnock was flattened around them. 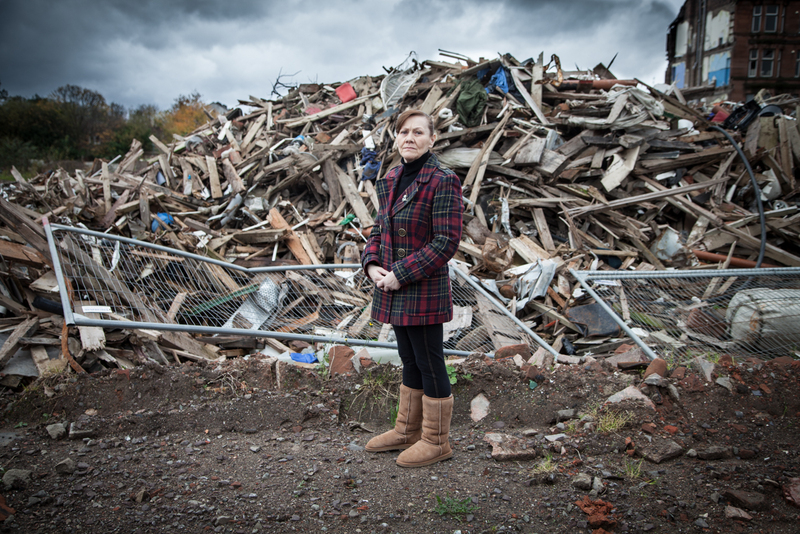 But in March 2011 the battle was lost and Margaret’s family evicted from their home. Mixing still photography, video reportage and interviews, this film follows Margaret’s story from March 2008 through to her eviction in March 2011. One of a series of short films on issues surrounding the redevelopment of Glasgow by photographer and filmmaker Chris Leslie.